Update: VirZoom will be providing the first 1,000 pre-orders with a free, lifetime subscription to VirZoom Plus. The Plus subscription adds to the game library by enabling real-time multiplayer, global leaderboards and fitness profile tracking. Find out more from the company's blog here. There are more standing experiences and games for virtual reality headsets in development now but none that require you to actually work out and break a sweat. That's what the VirZoom bike wants to do. 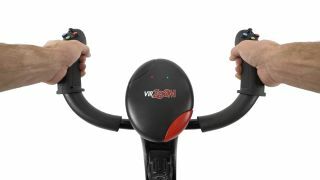 The VR stationary bike by company VirZoom made waves earlier this year during E3 where it was still just sensors attached to a bike. It had a lot of promise when I tried it with a PlayStation VR and flew around on a Pegasus but I wasn't sure if the tech would resurface. Turns out, the team has been hard at work refining its project. After much feedback, it was decided that building an actual stationary bike instead of using sensors on a normal bike was the best option. It will require some assembly - which I've been told is simply screwing four pieces in place - and it means you won't be able to use your own bike at home. Rather, you'll have to make room for another piece of furniture. However, if you don't have much exercise equipment to begin with, this shouldn't be a problem. It's a relatively small bike that shouldn't take up much room. The bike will also act as a controller for your Oculus Rift, PlayStation VR or HTC Vive with each game requiring you to pedal away and hopefully, get a workout - I sure did during my time with it at E3 and again more recently with the latest iteration. Specifically, the handles serve as the controller with buttons attached to select options in the menu or to shoot things in games. You'll then use slight movements with your head and shoulders to navigate your horse, race car or whatever it is you're embodying at the moment, to turn and look around. The VirZoom is smartly priced at $249.95 (about £166, AU$345) or $199.95 (about £133, AU$276) for early access buyers of the the first 300 units. The pricing for the major VR headsets is still up in the air but it's obvious they'll cost $350 (about £233, AU$486) or more. That means accessories and games can't be priced too high otherwise it will be harder to convince you to buy the necessary components for a decent PC (if it's needed) in addition to the headset itself. Sure you can plop down a couple hundred buck for a normal stationary bike, but where's the fun in that? An actual bike that involves being outside in nature is an option too...but who are we kidding? VR has probably been on your radar for some time now, and if you're going to get a headset, might as well reap the health benefits from active, indoor games. There's even multiplayer modes where you'll be able to play with friends while keeping track of all the calories you burn and your heart rate. VirZoom CEO and Co-founder Eric Janszen told me the SDK will be released so more games can be incorporated with the bike. He also noted that the team developed proprietary software to reduce motion sickness when playing the games. The VirZoom package includes five games plus a 1-month subscription to the game library. After that, it's $9.99 (about £9.99, AU$12) per month to get a comprehensive breakdown of your health metrics plus access to more games. Pre-orders are now being accepted from the website. The bike will be shipping in Q1 and will fall in line with the release of the VR headsets. Jokes aside, it's a big ask to invest in more virtual reality tech, but it seems to be the next source of entertainment that's full of potential. VirZoom seems be heading in the right direction by targeting health with the added bonus of making exercising fun in VR, and we could all use a little bit more motivation to be healthier.